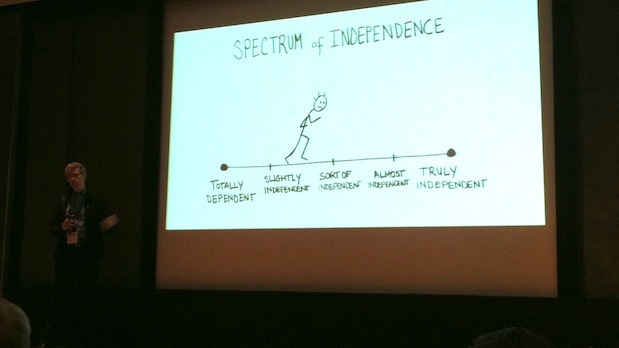 Peter Broderick's "Spectrum of Independence"
The IFP Independent Filmmaker Conference’s “Blitz Wisdom” panels are quick, TED-like talks from filmmakers and folks in the industry discussing their projects and/or offering tips and pointers. During Monday’s “Blitz Wisdom” session with Peter Broderick, President of Paradigm Consulting (helping filmmakers develop distribution and social media strategies), we learned some great tips on how maintaining a relationship with your audience after they’ve left the theater can help you develop a sustainable model of revenue. 1. Direct Funding – Once you’ve identified your audience and have their attention, you have a built-in base you can reach out to for funding future projects. They’ll already be receptive knowing your previous work. 2. Revenue – Your audience will also be receptive to other things you’re selling, and may want to purchase not just copies of your current film, but other merchandise you might create, such as t-shirts, DVDs of extras and outtakes, or previous films, etc. 3. Marketing – You can utilize your fan base and audience to help market and promote the film by sharing it with their social networks, friends and family. 4. 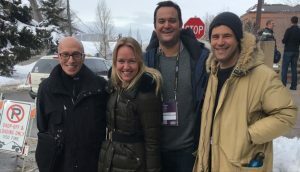 Crowdsourcing production needs – In one example Broderick gave, a filmmaker contacted his audience via social media for help translating their film into several languages which otherwise would’ve cost thousands of dollars. In essence, he outsourced part of his film’s postproduction to his fans, which cost him nothing but gave his fans a feeling of involvement in the film’s production. 5. Feedback – You can also market-test projects with your fan base. They’ll be happy to feel involved and gain special access to your work while you get the added benefit of getting feedback directly from the audience who sees your films. 6. Connections – You never know who may be a fan of your work, and you never know who they know, etc. etc. It pays to be connected with your fan base when they want to help you succeed! 7. Other Resources – Your audience can also be sourced for things like equipment, facilities, props, etc. Again, just another way to get your audience involved in your project while giving the filmmaker the added benefit of a lower budget (and hopefully, the ability to continue producing more films thanks to those savings).